Just as gin in Britain and vodka in Russia, America’s most renowned for its whisky. This delicious amber liquor once helped turn the tide of the Civil War, it survived Prohibition, and is now once again finding its way into the tumblers of a thirsty public. In his new book, Drink More Whiskey, Daniel Yaffe explores the fascinating history — and current state — of America’s signature spirit. The namesake of bourbon is Bourbon County, Kentucky, by all accounts the metaphysical center of the bourbon world even though no bourbon is actually made within the county limits. In fact, bourbon can be made anywhere on American soil; a bourbon made in Honolulu would have the same seal of approval as one made in Bardstown, Kentucky. Legend has it that the name bourbon stuck because Americans were brown-nosing the French (to whom they were shipping loads of whisky in French-owned New Orleans). Bourbon, named after a gallant ruling family in France, was a word that the French could pronounce with a certain je ne sais quoi. As a form of gratitude to France’s aid in the Revolutionary War and because of their colonial proximity to the early United States, enclaves of the American South have complex ties to the French. Bourbon County is hardly the only area whose name was borrowed from la République française. The cities of Versailles (pronounced with a Southern accent, Versales) and Paris are nestled in the Kentucky countryside not far from Louisville. Bourbon is now being produced across the United States, but Kentucky remains the symbolic and physical heart of bourbon making. 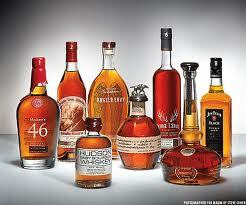 More than 80 per cent of US bourbon comes from Kentucky, and it is where the culture continues to flourish. There are more barrels of bourbon sitting around Kentucky right now than there are people in the state. Abraham Lincoln, who was born in Kentucky and saw it as a key region in the Union’s fight against the Confederacy, once famously said of the state, “I hope to have God on my side, but I must have Kentucky.” Its beautiful rolling hills, ancient oaks, and white picket fences are carbon copies of my Civil War daydreams during American history class. Although I wasn’t old enough to fit bourbon into my report about General Robert E. Lee, it was just as much a part of the battle as bayonets and blood. Lincoln knew whisky was important to keep his troops’ morale afloat and condoned General Ulysses S. Grant’s drinking habits, even inquiring as to what brand Grant drank so that he might give bottles to the rest of his generals. Working on managing your own troops? Grant is said to have loved OLD CROW bourbon, a brand you can still find at the back of the bottom shelf in liquor stores everywhere.